Well, our wedding passed off as planned at the weekend and all the hard work the women folk around here put in definitely paid off. The weather almost held out for us, and besides a little bit of rain made no difference to the day at all. I’d been given my orders, the night before the wedding, by Monica, one of our highlands, that she wanted a bit of a ‘DO’ for the wedding, so I’d been up extra early to get her looking all beautiful and at her best, for the big day. As well as Monica, the bride was beautiful, the groom scrubbed up well too and once again, it was another proud moment in the life of this Dad! For some weeks, ‘Betty’, one of our Aylesbury ducks has been sitting on eggs. As ducks do, she has been coming off her nest a couple of times each day to stretch her legs, have a bit of a bath and get a bite to eat, then goes back to looking after her eggs. The thing is though, since she started to sit on her eggs her personality has changed. I hadn’t realised that she had such anger issues. From being a placid, well natured duck, she now regularly chases me, for no reason and her quack is so loud, you can still hear her chuntering away above the sound of the lawn mower. It’s like she’s got out the wrong side of the bed, all the time. In the last couple of days we have had some movement as her eggs started hatching and she is now the proud Mother of 7 beautiful ducklings. 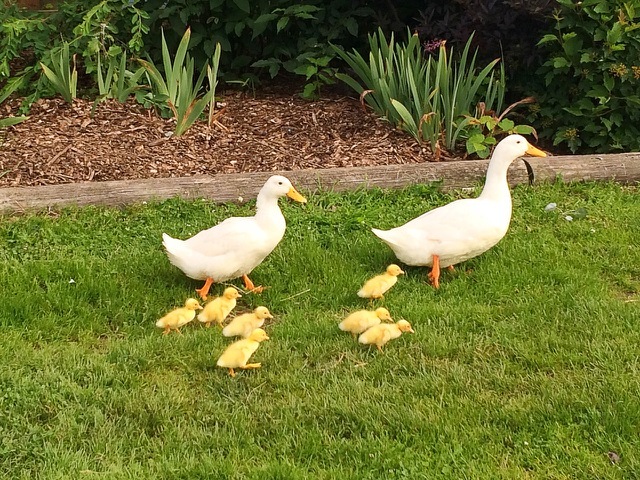 Hopefully, she will be a little nicer to be around now that all her ducklings have hatched. Mind you, I wouldn’t fancy getting a numb bum, sitting in one place for weeks on end either. I know I have moaned in the past about our friendly, neighbourhood bunnies, but this week things have unfortunately been taken to a whole new level. I have tried to be so tolerant and embrace them sharing our little patch of heaven, but this time they have crossed the line. There I was just tootling down the lane in Wendy’s mini, singing away, just loving life as you do, when a little orange light appeared in front of me. What on earth did it mean. All it said was 4×4!. When I could, I stopped and called the garage who then explained that the car would need to go in to get checked out. It was all arranged and the next day, only a short while later I got a call and then a video sent to me (technology eh?) showing that apparently someone had cut a cable under the vehicle and they had ruled out rodent damage. I immediately disagreed with them, in my head, as I instantly knew how the damage had occurred. You see we have a regular visitor, the same one who chooses to dig up my new turf outside the Teashop. On many occasions, from our front window, we have seen Mr. Rabbit hop under the car, as you can see his silhouette as he stands on his back legs, having what we thought was just a nosey about. How wrong we were. He had bitten clean through the cable and nibbled away on a couple of others too during his regular visits. The thing is though, that I’m now minus £150 and it’s time for ‘Roger’ to move on, so i’ll be having a stern word when I catch up with him!